Anjali and I made Ina Garten’s version of Irish Soda Bread yesterday at work to accompany the traditional Irish dinner we cooked for our clients. Dense but very moist, lightly sweet from the currants and just a hint of orange zest. Slathered with salty Kerrygold butter it spoke to my inner heritage, satisfying a deep longing for home made rustic bread. 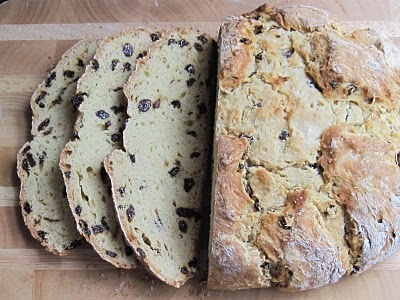 Skip the green beer this year but whip up a loaf of Irish soda bread to eat cold with afternoon tea or toasted in the morning with coffee. Wishing you the luck of the Irish on this St. Patrick’s Day. Mm looks good, Lydia! I like anything with currants 🙂 My Mom has that irish salted butter at home. Had never seen it before. I tried this bread and it did not cook all the way through. Did you use a convection oven? It did smell amazing though!